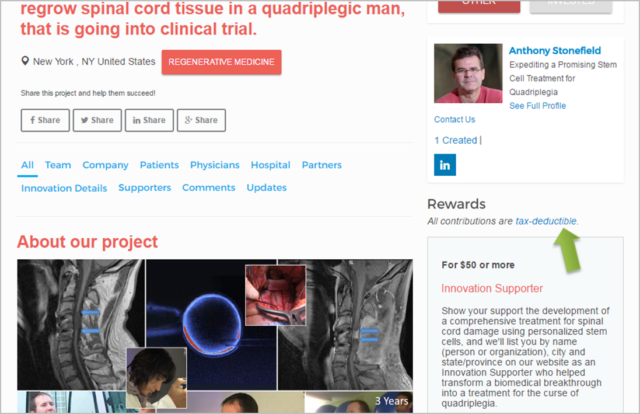 Many projects on MedStartr are enabled by tax deductible contributions. This is thanks to our partners and those of our clients that will accept donations on behalf of specific projects and then issue grants of the proceeds to teams that created the projects. These are called "restricted funds donations" in the charity fundraising world and most 501(c)3 corporations (a.k.a. Charities) will do this, especially for large donations. Which Charity will process my donation? We work with three charities mostly, but each team can bring their own and new ones are being added all the time. For cancer and patient education projects we work with Cancer101.org. For New York based projects we have worked with NYCBIO.org mostly. And for everything else, there is iHealth Trust, a Houston-based charity that was founded to help drive improved healthcare information and innovation. As soon as your contribution is processed, generally at the end of a campaign, Paypal generates a receipt which will have the name of the Charity on the top of the page. Once all accounting is done, the charity then issues a grant check in the amount of the proceeds. What percentage of my donation does the project get? Since there is a cost to the above processing as well as paypal and for MedStartr, the total fees areabout 12% - the prject gets 88% of all donations. This is much better than industry averages as the cost of fundraising, marking, and administration is vastly lower. Most importantly, that 88% is going to exactly the project you are donating to. We think this is a far better way to donate and hope you do too! If you are reading this FAQ page from a link on a project then the rewards and donations from that page are tax-deductible. We clearly state on our project pages which ones have tax deductible donations and which do not. See arrow below. If you don't see this phrase then the doantions are not tax deductible. Hopefully not, as that would mean they are a complete loss an it would be too early to tell that for a while anyway. We do not collect investments at all on the platform, only investor interest. The actual transactions happen offline. Are Corporate Donations Tax Deductible? Generally yes, but in actual practice, businesses can deduct most expenses anyway as R & D, marketing, or whatnot, so it is up to you and your company how you want to count your contribution. Please talk to an accountatnt if you have further questions. Yes. Most charitible 501(c)3 organizations accept restricted funds donation. We just automated it. Can my Charity do this to help raise funds for projects we support? Absolutely, call 530.MED.STAR today to get started. You will get your own landing page and everything!